Clifford T Ward died unnoticed Dec 18, 2001. One of his most loved songs had the line "Im not waving, Im drowning" to distinguish a shout for help from a wave of friendship. One of his earliest friends in the music business was John Peel who signed him to his Dandelion label in the early 70s. From there Ward moved on to Charisma and released a trio of splendid English albums, Home Thoughts (1973), Mantlepieces (1973) and Escalator (1975). His sole English hit was also his earliest single, Gaye, a quintessential pastoral story of love taken for granted then regretted. Much like how his passing is regretted. So few have heard of his work. The last time he appeared in the rock press was in a Buried Treasure review of his Escalator album in Mojo a few years ago. The best compilation of his works is Gaye And Other Stories which collects 20 tracks from these three albums to showcase the talents of Englands undiscovered storyteller. 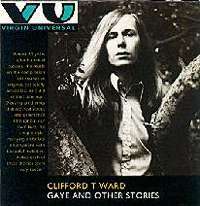 Ward never wrote a silly love song over the course of 10 albums. A schoolteacher by profession, he preferred to use language in a literate manner choosing allegory, juxtaposition, poetry and romanticism to articulate loneliness, regret, devotion, everyday chores, the modern world, history and the charms of a rustic life. His songs never repeated themselves nor relied on hackneyed phrases or schoolboy cliches. They strive to tell a story with as much color, prose and detail as could be wrung out of three minutes. His literate style earned him the nickname, the singing schoolteacher. Fame eluded this man because Ward was unusually retiring, preferring to stay at home with his three young children. He only once appeared on Top Of The Pops when Gaye made it to the Top 10 in England. 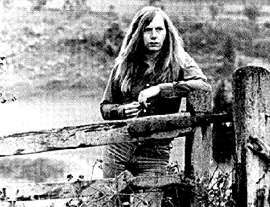 His appearance with his extremely long hair, fair complexion and bulky torso made him an unlikely pop star. For much of the 70s, Gaye excused himself from touring arguing that his music, which required much production and musicians to get that old world quality or marching band atmosphere, was just too complicated to tour with. But he was really a stay-at-home songwriter. His songs betrayed that. Scullery was a homily to a housewife and her chores. For Debbie And Her Friends was about looking after a crippled child. He also wrote about the aged and Miner for the strikers in 1974. Musically, Ward never borrowed from American rock n roll, the blues or folk music. His piano-based songwriting was distinctly European. His melodies were textured and came alive when accompanied by Richard Hewsons arrangements. Hewson made his mark orchestrating the pop film, Melody Fair. 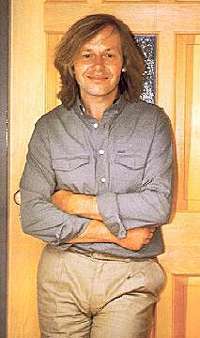 The American approximation to Ward was the works of Jimmy Webb. Sometime in 1987, Ward was diagnosed as suffering from the wasting disease, multiple sclerosis. It effectively ended any hope of a career in music. He could barely move and was bound in a wheelchair. But fans and friends who saw him recall none of that bitterness that people so afflicted would carry. In fact in A Day To Myself, Ward had written about how insignificant any of his woes must be when standing against the memory of soldiers who had gone to fight and died alone in a foreign land. NOTE: His albums in print are Gaye And Other Stories, his first album for John Peel, Singer Songwriter Plus and two new compilations Bittersweet and The Ways Of Love. Or you can write to a longtime fan, Liz Williams, who can make CD-Rs or minidisc copies with proceeds to Wards widow. Her address is at PO Box 59, Whitehaven CA26 3GA, UK.